Relay Races. Hand over an old-fashioned stopwatch and let them set up a relay race using the playset and some toys from the garage. Kids can time each other as they climb the rock wall, do the monkey bars, swing a certain number of times on the swings and then slide down the slide. Encourage them to try over and over again and so that they can decrease their time with each attempt. With older kids, increase the difficulty by providing them with a blindfold to wear while they navigate the course! Fort Building. Throw out some blankets, sheets and clothespins and let kids run wild with building forts! They could cover the sides and front of the playset for a secret hideout or attach clothesline from the playset to a nearby tree to create a puppet theater or home base and jail for tag games. Painting. If you have younger kids, a bucket of water and some paintbrushes can keep them busy for hours. Encourage them to “paint” the playset with water and then start on your fence when they’re done with that! Imagination Games. When kids use their imaginations, the playset can turn into any number of fun things: a pirate ship, jail, house, store, lemonade stand and lighthouse, just to name a few! Keep a bin of random items (cups, bowls, sticks, etc.) in your garage and allow your kids to use them to aid in their play. What games and activities do your kids enjoy doing on their playset? 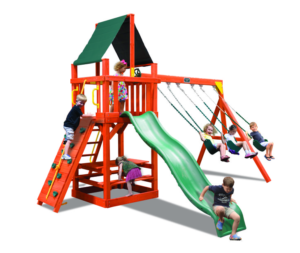 Looking to add or upgrade your current playset before summer? Stop by Happy Backyards in Franklin to see which of our models might be the best fit for your family!